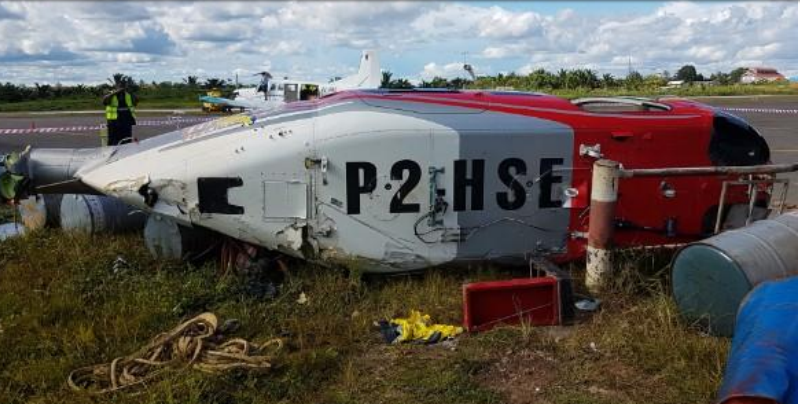 Bell 407 P2-HSE of Niugini Helicopters was destroyed during take off at Kiunga in Papua New Guinea following confusion about an underslung load according to an investigation report published by the PNG AIC. On 15 February 2017, at approximately 05:00 UTC (15:00 local), the pilot…was commencing a normal translational-lift takeoff, to the south-south west, across the aerodrome apron, and over the terminal buildings. The flight was a VFR charter operation carrying two passengers to a Digicel [mobile phone] tower site, 20 nm south of Kiunga Aerodrome. 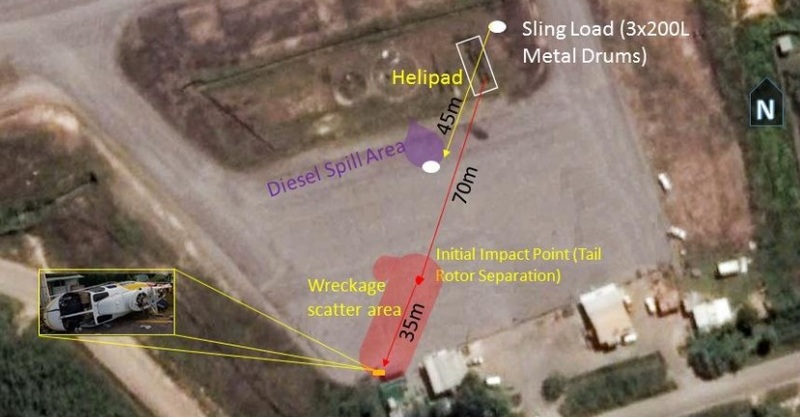 The pilot reported that when the helicopter was about 100 ft AGL and at a speed (IAS) about 30 or 40 kts, it suddenly jerked to the left, rapidly descended, and impacted the tarmac, and was destroyed. The pilot and both passengers sustained minor injuries. 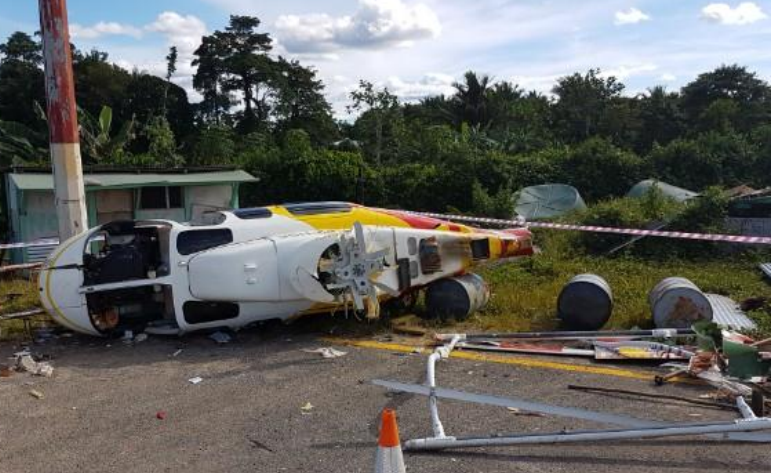 A 50 m longline attached to a net carrying three full 200 L metal drums containing diesel fuel, was ‘attached’ to the helicopter. Helicopter Sling Load Operations (HESLO) with an underslung load (USL) had been planned, however not for that flight. The Operator did not have any qualified person tasked to carry out the duties of a loadmaster for any of the sling operations out of Kiunga. During the interview with the AIC, the pilot stated that he brought out the longline and authorised the [non-operator] personnel to load the drums into the net. He said he gave them instructions on how to load them, stating that they should put the drums upright. He said that he was unaware that the longline that he and the passengers had prepared for the next [i.e. subsequent] flight to the same location, was attached to the helicopter prior to lift-off. One of the passengers was the service/maintenance technician for R&A Marine Services. The pilot reported that this passenger did not usually assist with the ground work. The other passenger, a Kiunga local, was the technician’s assistant, and his job was to carry tools and equipment for the technician. He assisted the pilot by loading the drums in the net and rigging it. He had little education and was barely literate in English. The helicopter was fitted with a retractable mirror, but the pilot did not use it during the pre-start and takeoff. The pilot stated that it was a passenger ‘only’ flight, and so he did not need to deploy the mirror. There is no evidence to suggest that the long line was hooked onto the belly hook of the helicopter. The investigation determined that the sling was not attached to the belly hook of the helicopter. It draped over the left step, above the left landing gear skid of the helicopter. It is likely that in throwing the line under the helicopter, the shackle draped over the step and skid from under the helicopter. During the take off and forward flight, the sling played out to its full length and became taut when the shackle snagged on the step, abruptly arresting the forward movement of the helicopter, and dragging it down onto its left side in uncontrolled flight. The step subsequently fractured as a result of the applied load. As the helicopter was dragged down, recovery from the uncontrolled flight was not possible from such a low height. Just 11 days before this accident we wrote this article: Unexpected Load: AS350B3 USL / External Cargo Accident in Norway. This examined the Accident Investigation Board Norway (AIBN - the Statens Havarikommisjon for Transport [SHT] in Norwegian) final report on a very similar accident that occurred near Toms, in Norway on 20 July 2016. Airbus Helicopters AS350B3 LN-OSN of HeliScan was supporting powerline construction by Consorzio Italia 2000 for power utility Statnett. In that case miscommunication meant the ground crew attached a long-line and load, while the pilot was expecting, like the B407 case in PNG, to move personnel only. Fatal Low Altitude Hover Power Loss: Power Line Maintenance Project looks at how an engine compressor failure while installing power line markers resulted in an unsurvivable impact and fire. The Flight Safety Foundation (FSF) run Helicopter External Load Operations for Ground Personnel training. Aerossurance is pleased to be supporting the annual Chartered Institute of Ergonomics & Human Factors’ (CIEHF) Human Factors in Aviation Safety Conference for the third year running. We will be presenting for the second year running too, this time on the subject of the FSF‘s Maintenance Observation Programme concept. This year the conference takes place 13 to 14 November 2017 at the Hilton London Gatwick Airport, UK with the theme: How do we improve human performance in today’s aviation business? Aerossurance will also be presenting at EASA‘s 11th Rotorcraft Symposium on Cologne on 5 December 2017 on human centred design (HCD) for rotorcraft. This presentation will be live streamed.